One of the things I love the most about the Amalfi Coast is being near the sea again. Those of you who popped over to Italytutto.com to read my Behind the Blog interview now know that I grew up for many years on the beach in Florida and spent my undergrad college days in America’s Sailing Capital, Annapolis, Maryland. While never an avid boater or fanatical swimmer, I have to say I am more at ease and happier when I live close to the water. The sounds, the smells, the lifestyle, and, of course, the boats. I love how the ports fill up with boats during the summer months, many of which are just passing through. Walking along and looking at the clever, fun, and sometimes bizarre names people give their boats is one of my favorite evening activities. On Capri I found this big seagull who seemed to be admiring the boats just like me. Tomorrow we are renting a small boat and exploring up and down the Amalfi Coast all day. I can’t wait! While I have been out on boats a lot here, this will be the first time on a small private boat where we can go wherever we want. I am looking forward to discovering the little coves, tiny beaches and grottos along this beautiful coastline! Behind the Blog – Grazie Italytutto! I feel quite honored to be featured on Italytutto.com in its first blogger profile called Behind the Blog – Laura from Ciao Amalfi! 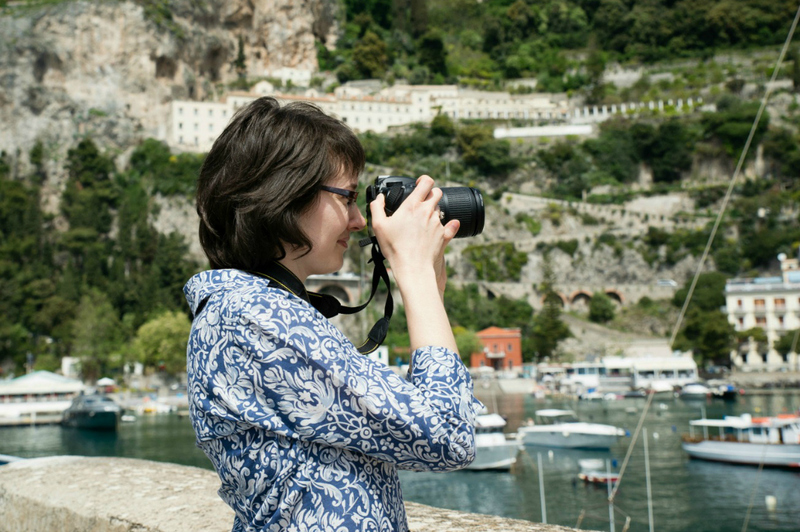 I had a great time answering the fun and thought-provoking questions about my background, my life here on the Amalfi Coast, blogging, photography, the adventures of launching a freelance writing career, and my favorite orange cat named Puffy. Since I don’t often reveal too much about my personal life here on Ciao Amalfi, this is the real inside scoop! And since Puffy hasn’t made an appearance recently, here he is sporting his “sleek summer look” as I described it on Italytutto. He looks like a completely different cat when compared to the orange puffball he is during the winter! But I can’t imagine he would look this cool if he still had all that winter fur. Many thanks to Italytutto.com for the Behind the Blog feature. I look forward to learning more about my fellow Italy blogging friends in upcoming Behind the Blog features! Sunday Shout-out: Welcome back to Florence Katie! Back in April I featured Katie from Olio di Olive e Sogni di Vino as one of my first Sunday Shout-outs. I wrote about how at that moment we were both dreaming of Italy, and how Katie was making plans to move back to Florence. Now I am so pleased to say that Katie is finally in Florence, and I’m sure with exactly that same happy grin on her face! I know she is already out taking a zillion photos, and I can’t wait to follow along on her blog. With many wonderful adventures ahead, I wish all my best to Katie! Welcome back to Florence ! Awhile back the lovely Katie from Olio di Oliva e Sogni di Vino shared with me the One Lovely Blog Award. What a sweet and thoughtful surprise. Grazie Katie! I would like to pass this award on to a selection of my lovely readers with lovely blogs who stop by often and leave me sweet comments. It is always a joy to hear from all of you! Many thanks to all of you for your support, feedback and kind words. Warm wishes for a lovely weekend to everyone reading! Today is the feast day celebrating Saint Mary Magdalen, or Santa Maria Maddalena as she is called here in Italy. On the Amalfi Coast it is the biggest celebration of the year for the city of Atrani, just a hop, skip, and a jump from Amalfi. The Collegiata di S. Maria Maddalena sits proudly atop the city of Atrani with its beautiful and distinctive 16th-century campanile. The city of Atrani has been setting up lights and preparing for the celebrations all week. The fireworks started yesterday. Tonight I will experience this festival and visit the inside of this important church for the first time. Photos and videos to come!